Peg Perego offers two different double strollers to choose from, each with their own strengths and features, depending on what your family needs. Children who are different ages, especially if the younger one is an infant, will do well with the Peg Perego Aria Twin 60-40 because one seat is slightly larger for a 60 pound weight limit. 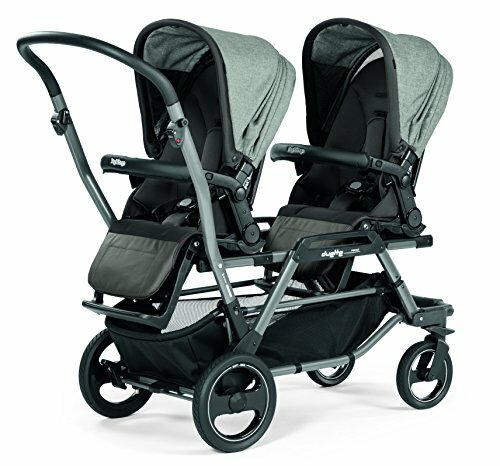 It is a very unique way to solve the problem of unbalanced weight for siblings, so read more about the Aria Twin 60-40 below. Travel system with adapters, the Book for Two can accept either one or two Primo Viaggio 4/35 car seats. Very Large, practical and easy loading storage basket with smaller pockets included. Versatile chassis is able to hold reversible seats, Primo Viaggio car seats and Pop-Up bassinets in many different configurations. Travel system compatible with Primo Viaggio car seats; accepts two car seats directly on to chassis without the need for adapters. Both seats have a generous recline that can be implemented independently allowing children their preferred comfort level. Central handle allows parent to maneuver the stroller with just one hand. LIGHTWEIGHT - Enjoy the convenience of multiple seating options in a lighter-weight aluminum frame that is only 34 lbs. Each seat accommodates up to 40 pounds. FITS TWO COMFORTABLY - Accommodates two infant car seats. Brand specific "click-in" adapters and universal car seat adapter available for purchase separately. 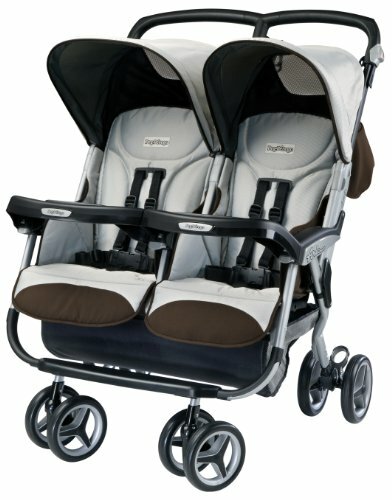 The Duette SW tandem is a Peg Perego double stroller that is made especially for twins. 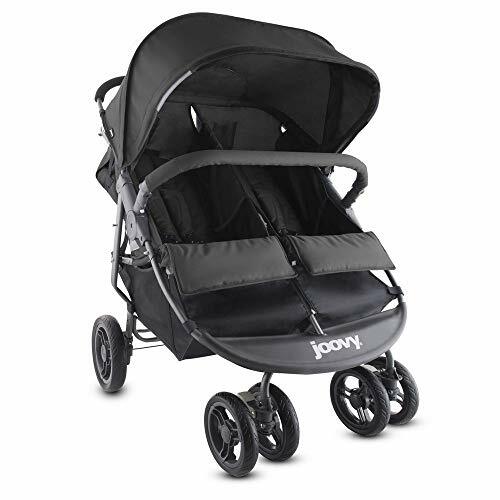 It can accommodate two infant car seats and you may position the stroller seats in several different positions. But the reviews aren’t that great. Find out why below. Peg Perego has come up with an innovative idea: A balanced side-by-side stroller for siblings. 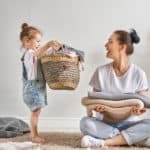 Any parent with different aged children can tell you how difficult it can be to push a side-by-side with two different weights on either side. Your stroller is always unbalanced and not that comfortable to push, right? But what can you do? The Aria Twin 60-40 solves this problem by having a side for each child as he or she grows. 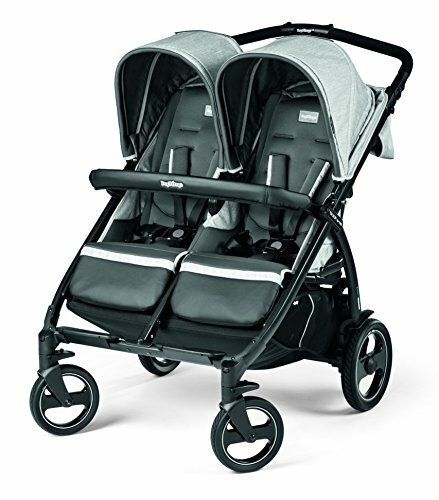 This Peg Perego double stroller is travel system compatible, so when the younger sibling is still a baby, use a Primo Viaggio car seat on the 60 side and the older sibling sits in the 40 side. Once your baby outgrows the car seat, the two switch places in this Aria double stroller and the older sibling sits in the 60 side. What a unique way to solve this problem! The 60 and the 40 refer to how many pounds each side can accommodate. This Peg Perego double stroller has great steering maneuverability and is smooth riding. The individual sun canopies are ratcheted and can come all the way down to the snack trays! Each child has a snack tray that swivels outward for easy in-and-out. The Aria folds and unfolds easily and can stand alone once folded, which is always appreciated by busy moms who are getting their kids into the car and don’t want their nice stroller dirtied while it lays on the ground. It’s a rather lightweight double stroller weighing in at almost 22 pounds and it can easily fit through most standard doorways. Compact enough to fit into most average sized cars, the Aria Twin is convenient for storage purposes. You will be very happy to know that the Aria Twin 60-40 has earned “very good” ratings on Consumer Reports for both maneuverability and safety and a “good” mark for ease of use. Light weight is the main reason quoted time and again for the positive reviews on this Peg Perego double stroller. 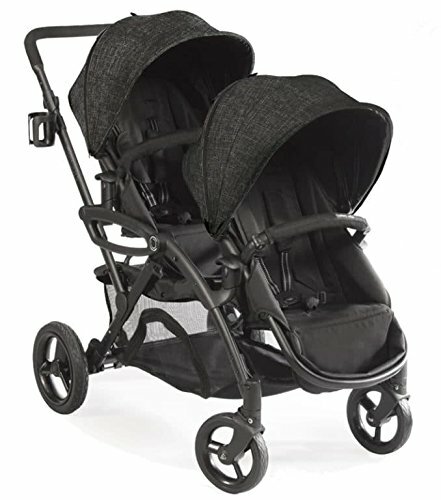 The Aria is one of the most lightweight double side-by-side strollers on the market and it weighs only 19½ pounds. The main disadvantage is that the snack trays don’t each have cup holders. The 60 side has two cup holders (used also to help secure the car seat) while the 40 side just has a small groove for snacks. The older child sitting on the 60 side will have to share his or her cup holder with the younger one, and for many siblings, this can be a big problem! Moms say that the snack tray on the 40 side is incredibly tiny and not worth it. Many parents don’t care for the Freedom of Movement 5-point safety harness. 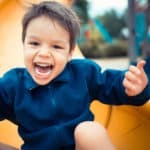 It’s basically a 5-point harness that is attached to the seat lower down the back so that the child can lean forward and around without being hindered. The parents who don’t like this style harness don’t see the point of the whole thing; it should be secure in the back or just be a three-point harness. There are no parent cup holders in the Aria Twin, but many moms purchase a Velcro cup holder that they can attach. Take a look at this official video demo of the Peg Perego Aria Twin 60-40. Despite that the demo is a few years old already, the stroller has changed only slightly in design. 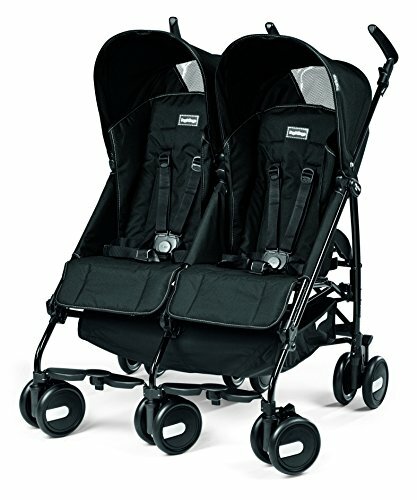 Most tandem strollers are made for siblings, since one seat is often superior to the other, usually the younger one is enclosed in the back seat. 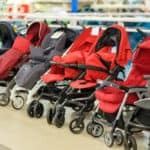 Parents of twins must search for a stroller that gives equal benefits to both children and the Peg Perego Duette is one of those few strollers. The two stroller seats are removable and you can position them in several different ways: both facing forward, both facing Mom, facing each other if the children get along and want to play, or facing opposite directions when they need to be separated. This variety of choices is so helpful! The generous sun canopies on the seats are also removable, adding even more choice. The Duette also comes with leg covers for each child. The Duette accommodates one or two Primo Viaggio SIP 30/30 car seats, while many tandem strollers can only take one car seat. This is very important for families with twins. Remove the stroller seats and place the car seats right onto the chassis until the babies are big enough to be in the stroller seat. Both stroller seats can recline fully as well whereas in other tandem strollers, the front seat usually does not recline much at all. Large wheels and all-wheel suspension system make this Peg Perego double stroller a dream to drive. The Duette has centrally controlled brakes on the rear wheels and this stroller comes equipped with a steering wheel to make maneuverability extremely easy. 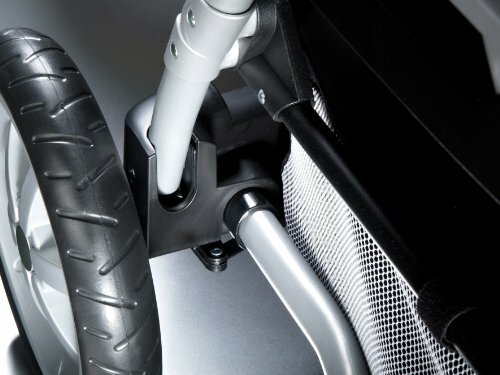 The steering wheel is height and angle adjustable for maximum control. For better stability, you can lock the front swivel wheels with a push of a button on the steering wheel. The downsides of the Peg Perego Duette are numerous. For one, this Peg Perego double stroller is HEAVY. While the weight has come down the last few years’ models, the Duette still weighs a whopping 45 pounds! Another disadvantage is that the Duette cannot be folded down easily and you must own a large SUV for it to fit; the seats must each be detached before you fold down the chassis. Next, it is very difficult to access the storage basket beneath the seats unless your children are facing one another. Lastly, the Duette is expensive and not for families on a budget. Having kids doesn’t mean sacrificing style. Since 2008 we’ve been helping moms find baby gear that’s high on fashion & function.